I love your articles, you are one of my favourite writers in the magazine! I really like Tangs, they are my preferred marine fish and I currently have 4 in my 140 gallon aquarium. The tank is 127 cm long and my question relates to the best way to aquascape this aquarium, as I am not happy with it at the moment. I have a lot of live rock in there, which is built up on the back wall of the aquarium. I have started to wonder whether this way of aquascaping is best for the fish that I have got. 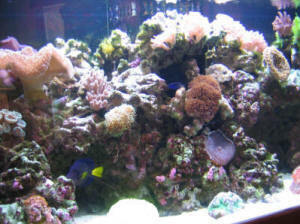 The problem is that the tank is run using the Berlin method so the live rock provides the bulk of the filtration. I think I should be providing more swimming room and open space for the tangs, but reducing the amount of live rock may have a detrimental effect on the filtration if that makes sense? Can you suggest any way around this issue? My Nitrate is currently at 5ppm with ammonia and nitrite both at zero. R: Thank you for your kind words Gareth. I too greatly favour the family Acanthuridae for aquarium use, though there are some dogs amongst the group, and in diving a great deal around the worlds tropical reefs, one is given to more understanding about who can be crowded with whom in and amongst Doctorfishes. Without knowing what species you house I am at a bit of a loss to state how you might proceed here but I do definitely have landscaping ideas to share. First, I am in confluence with your mentioned desire to provide open, swimming spaces for your aquatic charges. Tangs are in constant motion during daylight hours in the wild and in captivity, and our systems are woefully small compared with the spaces they cruise on the reef. That being said, rather than the too-typical wall of rock many hobbyists conform to, if your system is wide enough, I suggest your devising stacked bommies of rock maybe better described as pillars of upright arranged pieces providing visual breaks and a fun obstacle course for your fishes to swim through. Now, fashioning these pillars can be done in a few ways. If you're very fortunate, you may have rocks that can simply be placed one on top of t'other. Do take care here if this is the route you go. A better, more stable route is to either drill and peg the rocks together or epoxy them together and let dry/set up a bit before re-emerging. To respond to your last point, regarding the possibility that simply piling rock may lead to filtration problems I am in agreement. One wants to have circulation at least behind such assemblages, and really I am not a fan of such arrangements in any case I say, tear down those walls! In your case, 5 ppm of NO3 is no big issue. I would not be concerned with this trace amount. - Compatibility of Purple Tang and Desjardinii - I think the exchange below answered my previous question, except one of my conditions is slightly varied: namely, both the purple and the Sailfin are about 5". So I guess it's who knows? <Nah... I predict trouble. Especially if the tank isn't big enough. Cheers, J -- > "Mixing Zebrasoma Tangs Mr. Fenner, I hate to bother you again but I need to ask you one last question. I am purchasing a Sailfin and purple tang, is this a wise choice or would they fight and not be compatible. Currently I have a Naso tang as well. I feel really bad to email again, and I have look at your comments at you site, too. Again, I am sorry for asking this question. I can imagine you getting tons of email regarding similar questions. Thanks <If these animals are started small (three inches or so total length), AND the tank large enough, otherwise not already too crowded, these Zebrasoma should get along.... though with some ceremonial "jousting" for the first few days. Best to place at the same time/day. Bob Fenner>"
-Yellow and Kole tang together?- Please help! Much to my dismay, I was unfortunately led to believe (by my local fish store) that it would be ok to put a Kole Tang in with a Yellow Tang of the same size. <Actually, besides the standard new addition aggression, it should work out just fine.> I have a 56 gallon Perfecto tank. <Not sure about the dimensions on that one, but I would recommend that tangs of this size (I read ahead!) be in at least a 4' long tank. That said, if this is 4' long, and both of these fish are 3", I don't see a problem.> I plan on taking the Yellow Tang back to the store tomorrow, but for future reference, could you please advise me on the best fish to put in a tank with my current inhabitants? They are as follows: 1 3" Yellow Eyed Kole Tang 2 Peppermint Shrimp 1 2" Maroon Clownfish 3 Turbo Snails 1 Purple Pseudo <Being that you'll need to remove almost any tang you choose (the Kole may be alright) for this tank once they become too large, you may want to stay away from them. How about a Centropyge angel? Lemonpeel angels, while they may nip at coral, are a beautiful yellow with blue rings around the eyes. It would be a great yellow tang replacement! Good luck, -Kevin> Thank you so much for any advice you'd be able to offer! Mixing tang(s) Hey guys, this time I’ll keep it short. <Okey doke, Don here today> My tank has been set up for about 3 months and everything is going well. (Once again thanks for all the advice before) <Glad we could help> This time want to get your view on putting two tangs together. I’m referring to Acanthurus japonicus and Acanthurus sohal . I know that you’re not supposed to keep co-specifics together, but these two seem not to be look alike. My tank is 90gal with 35 gal sump. I have over 100lbs of live rock and about 40lbs of live sand. Right now I have 1 Foxface , 1 yellow tang and 1 Kole tang. All of the above are about 4 inches in size and seem to be doing very well (yellow tangs tries to boss other two around sometimes) <Since you already have two tangs and are adding two more, you are combining 4 tangs. In a 90G tank, this is 3 too many IMO. The yellow is likely to become more and more aggressive and the 4 fish will range from 8-18". Too big for this tank. On the other hand if there is no way to have above two together which one is better suited for aquarium living. <The A. japonicus would be the better choice of the two, but not with any other large fish in this size tank.> Any suggestions are welcome. Once again thank you for your help. <No problem, Don> Pavel S.